I’ve said it before, but we’re constantly blown away by all the things we don’t know that Maya knows. For as much time as we spend together — teaching her, nurturing her — she still spends a good portion of her day at preschool. And though we get a little write-up each day detailing her day, there’s no way to really grasp the full scope of what she is absorbing, short of being a fly on the wall. Fortunately for us, she is one of those kids (at least for now!) who likes to offer up what she’s learning, generally in the form of a tease. For example … she’ll begin singing a new song in a whisper til we ask her to sing it louder. Or she’ll tell us part of a story about what happened in Red Room (her class) but wait for us to prompt her with more questions before the whole saga unfolds. It’s fascinating to me, watching her toddler mind work, make connections. And speaking of her mind working … Her memory — it’s ridiculous. She still remembers that I spilled lemonade at Sam’s Club three months ago. That she rode the blue airplane at the AirZoo three weeks ago with my dad and sister. That she left her stuffed seahorse in the backseat of Daddy’s car. Literally, nothing gets past this kid. (Likewise, we’ve had to curb our adult conversations around her because she repeats everything she hears!). Apparently at school they’ve been focusing on manners lately, which is great because it reinforces what we teach her at home. “We SHARE with our friends. If we don’t share, our friends be SAD,” she told us at the children’s museum today when another child was trying to play with her puzzle. “We have to clean up and THEN we can have our snack.” I enjoy this one most of the time … except when it’s 8:30 (i.e., past her bedtime) and she wants to clean up ALL her toys and frankly I just want her to go to bed). “We don’t push our friends, or hit our friends. We talk NICE to our friends and mommies and daddies.” This one we hear on a daily basis and it’s one that bears repeating because she tends to get a ‘tude with me quite often. She’s learning lots of other things at school, too. For example, she’s gotten great at counting out objects and rarely makes a mistake nowadays. 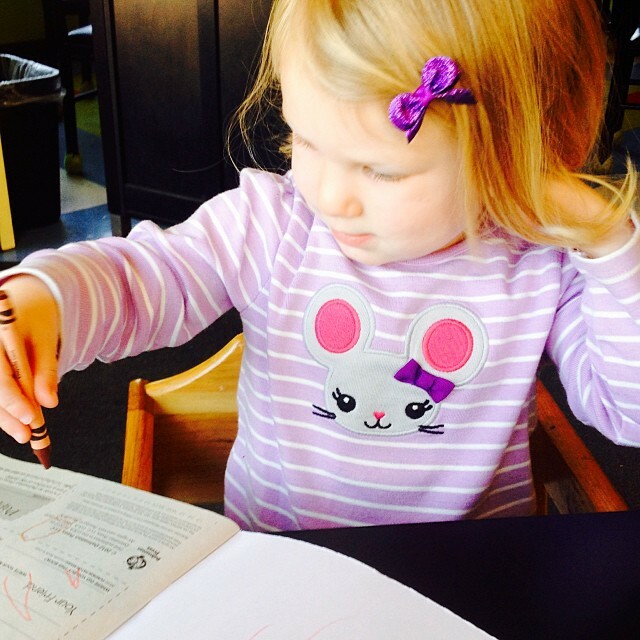 In addition, she can call out letters and numbers she sees on a page — a huge milestone. Both Luis and I were avid readers as kids and so it’s our hope she will be, too. So far, she’s on the right path. And, finally, today we discovered she can write two letters: “M” and “A,” which blew our minds. We were at brunch this morning, fixing our coffees when she looked up from her coloring book — beaming with pride — and said, “Look Mommy, I made an ‘A’!” And sure enough, she had!!! (She also wrote an “M” at home today on a piece of paper). I feel like there is just SO MUCH she knows that we don’t even know about … and while on the one hand I sometimes wish it was us teaching her everything she knows, I’m also grateful for all the places she’s learning … both inside and outside of our home. As a parent, it can be hard to give up that control — it means putting our faith in her school and teachers, believing in the values they are teaching her and the education they are providing to her. But we couldn’t be happier with her school and the experiences she is having there. And if that means not knowing all she knows and learning as she chooses to share … well, we’ll take it. Though this “terrible twos” stage isn’t a walk in the park (and I hear three is even worse …!) it’s days like today when I just swell with pride and admiration for this little girl who brings so much sunshine –and love– into our lives.